Yerba Santa. The herb exerts a strong stimulating action that is most pronounced on the lungs and is said to be a great expectorant that loosens and expels mucus and phlegm from respiratory system and relieves chest congestion, asthma, bronchitis, sinusitis, dry cough, chest colds, chronic laryngitis, "runny nose" and many other conditions where there is excessive mucus to be expelled from the body. It has been used to purify the system and cleanse the blood, providing an overall invigorated feeling that is thought to retard aging, reduce fatigue, stimulate the mind and energize tired limbs. 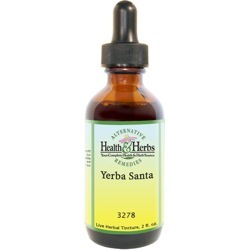 Yerba Santa helps acts to cleanse and stimulate the efficient removal of waste products from the body, and as such, it is believed to purify the system and cleanse the blood, providing an overall invigorated feeling. The herb is said to retard aging, reduce fatigue, stimulate the mind, energize tired limbs, ease rheumatism and promote healing. Yerba Santa is believed to reduce spasms, improve digestion, pep up the appetite, and ease stomachaches, flatulence, and vomiting. In addition, it has also been used to relieve diarrhea and dysentery. In 1992, studies indicated that flavonoid extracts from Yerba Santa exhibited inhibition of a potent cancer-causing chemical; hopefully, there will be more research in this area that will produce positive results. Used externally, Yerba Santa has been added to poultices for wounds, bruises, sprains, sores and insect bites. Ingredients: Yerba Santa, Structured Water, 20% Alcohol. Non-Alcohol: Yerba Santa, Structured Water, Vegetable Glycerin. Contraindications: Pregnant and nursing women should not use Yerba Santa.